Carry your defibrillator with ease. This case is designed to hold a Lifeline AED or Lifeline AUTO. There is storage for extra sets of pads, one spare battery and other first aid equipment. Made of lightweight ballistic nylon this case is durable, whilst not being a hard case, and has a carry handle and reflective safety strip. Lettering on the front clearly identifies your unit. The benefit of a defibrillator in saving a sudden cardiac arrest victim’s life can be undervalued. Having purchased your Lifeline AED you are aware of the risks of sudden cardiac death and have taken the first step in protecting your staff/the ones you love. But are you aware of what a sudden cardiac arrest is and how your defibrillator can help? Sudden cardiac arrest is a leading cause of death in Australians each year. In fact, 15,000-20,000 people die of sudden cardiac arrest each year and a victim only has 2%-5% chance of survival. There is a lot of confusion surrounding sudden cardiac arrest and its causes. The fact that people of all ages (including the very young) can suffer from cardiac arrest confuses many. Because how can a young child have heart disease? The truth is that sudden cardiac arrest is not just caused by heart disease. Coronary heart disease is attributable to around 80% of sudden cardiac arrest deaths, however you do not need to have high cholesterol or blood pressure to become a victim. Sudden cardiac arrest is caused by the malfunctioning of the heart’s electrical system, not necessarily the blockage of heart valves. The misfiring of electrical impulses to the heart causes the organ to beat too fast, too slow or irregularly, which prevents blood flow around the body. The blood that is pushed around our body by the heart’s beating is what provides oxygen to our vital organs, and without this, our body is starved of this oxygen. This causes irreversible brain damage in the first 4-6 minutes of collapse and further fatal damage thereafter. The malfunctioning of the heart’s electrical system can be caused by a myriad of elements such as; underlying heart conditions, heart disease, trauma and drug use. This is why the young and old can both become victims. A defibrillator provides electrical pulses to the heart that can help shock it back into regular rhythm, providing oxygen back to the body’s organs. This is why a defibrillator unit is such an important part of the chain of survival for victims. You need your defibrillator to be easily accessible and protected from damage. Your Defibtech Soft Carrying Case will allow you to transport your defibrillator and other equipment simultaneously, a well as providing a protective case for storage. The bold lettering identifies the unit for anyone who needs access and the reflective safety strip makes the case highly visible even in low lighting. 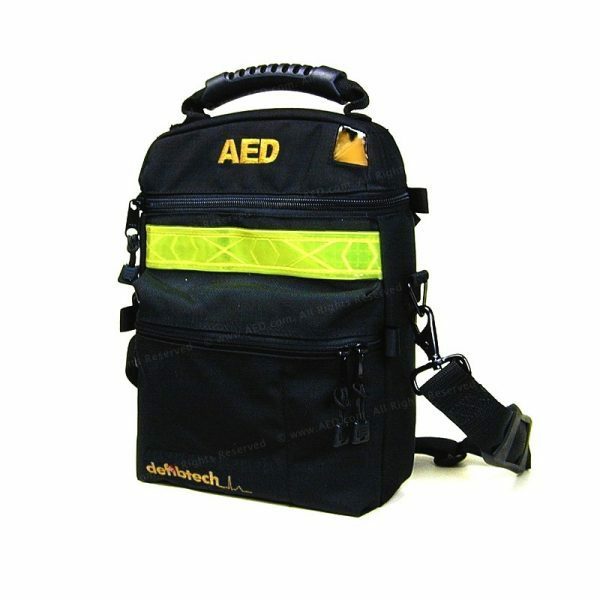 Defibtech is a leader in the emergency response equipment industry. It provides the market with reliable and high quality products for competitive prices. Their units were selected to protect the athletes and spectators of the Winter Olympic Games.